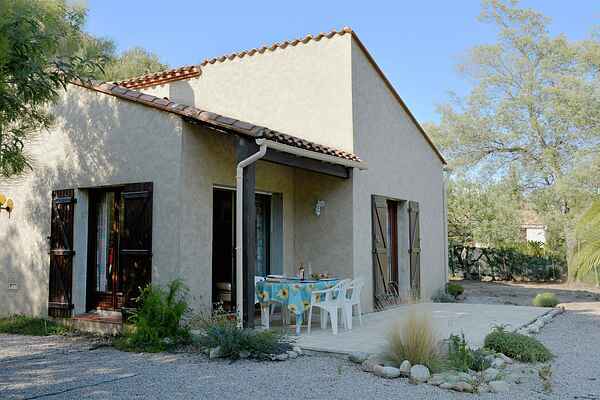 Nice holiday house less than 20 km from the sandy beaches of Argelès-sur-Mer and Collioure. The location is near a village of hot springs, known for its very pleasant spa treatments. The spring water is healthy and full of minerals and salts. What's especially nice is that the water is naturally carbonated. The town itself is brimming with nice cafes and restaurants. The surrounding area is great for going on long hikes, adventurous mountain bike rides and canoe trips. The Spanish border is also an easy drive from here - the little border town of Le Perthus is just 9 km from the house. It's a nice destination that has a very Spanish feel with its tapas and restaurants. The house is situated on a hill and is surrounded by a garden where you can enjoy very long views. Everything is on one level, with a spacious living room and an open-plan kitchen equipped with all the conveniences. The bedrooms share a bathroom.